Get priceless information on your store’s current situation. Track your visitors, the visits per month and the popular products. You can view your top selling products and you can see the number of sales of the latest 6 months on your Soldigo dashboard. The Statistics app gives a detailed view of your store’s evolution. 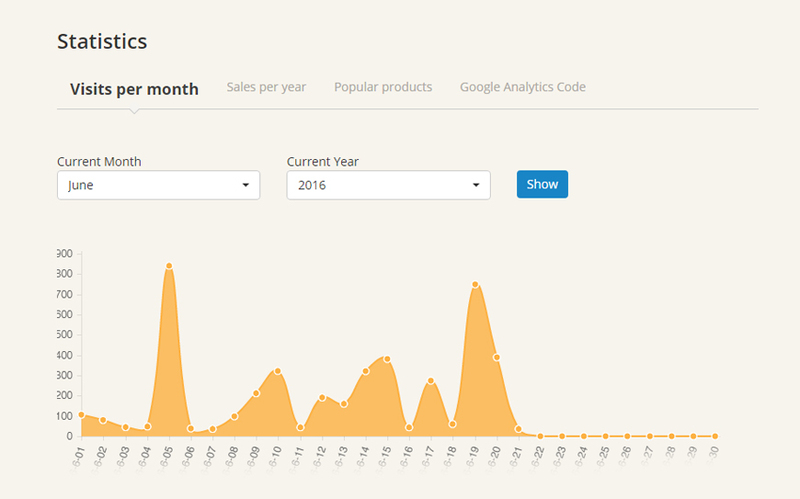 You can view the number of visitors of your store based on the month and the year of visit. Gives you a detailed view on how many items you sell on a daily basis. See which is the most viewed product and which is the most purchased product. It helps you make future decisions. For more detailed analytics connect your Soldigo store with the popular analytic tool powered by Google. Simply copy your Google analytics tracking id and paste it into the Statistics app’s Google Analytics tab. To find the tracking ID of your Google Analytics account click here.